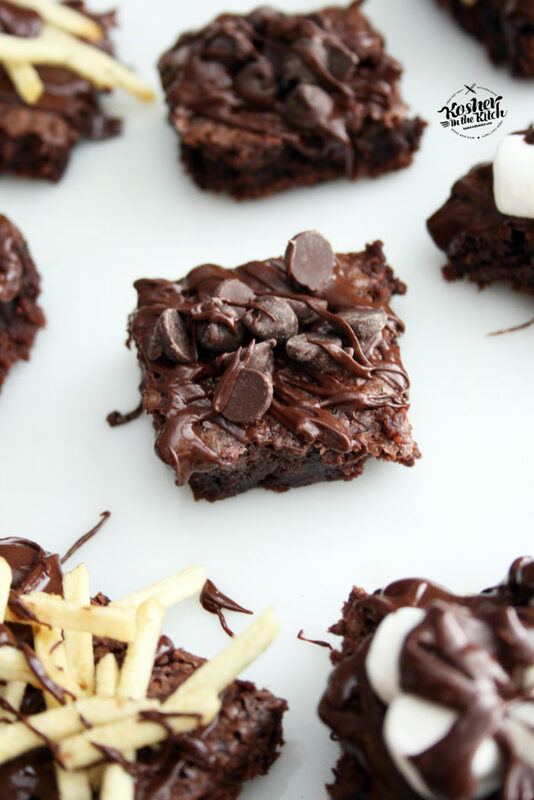 BEST Passover Brownies - Kosher In The Kitch! 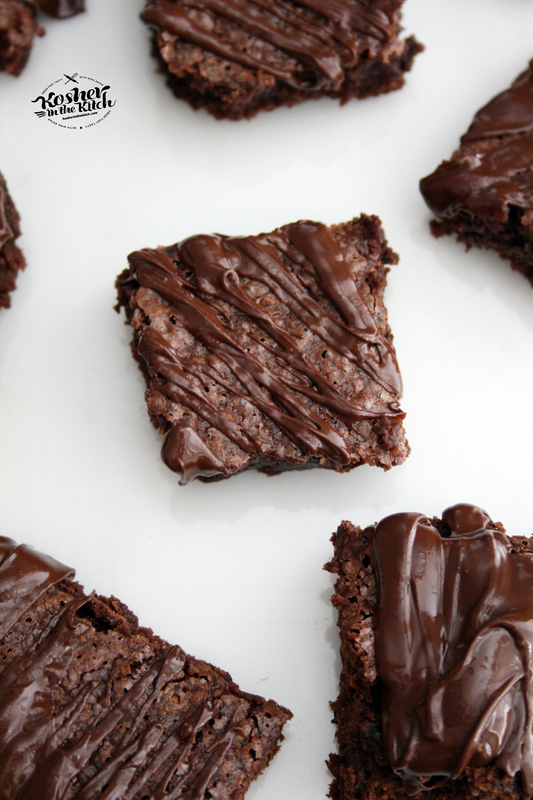 BEST Passover Brownies - Kosher In The Kitch! Anxious about missing your cakes and desserts over Pesach? Fear not. Once you try this recipe you will never again fear the holiday of no flour! This is a family fav and always made our house the place to be over Passover. Be prepared to make a double batch of this recipe since it’s usually devoured within minutes of leaving the oven! Mix the above ingredients together in a large mixing bowl then bake in a 9×13 pan on 350′ for about 25 minutes or until done. OPTIONAL TOPPINGS: Melt chocolate chips in the oven on 30 second increments, stirring until smooth and melted. 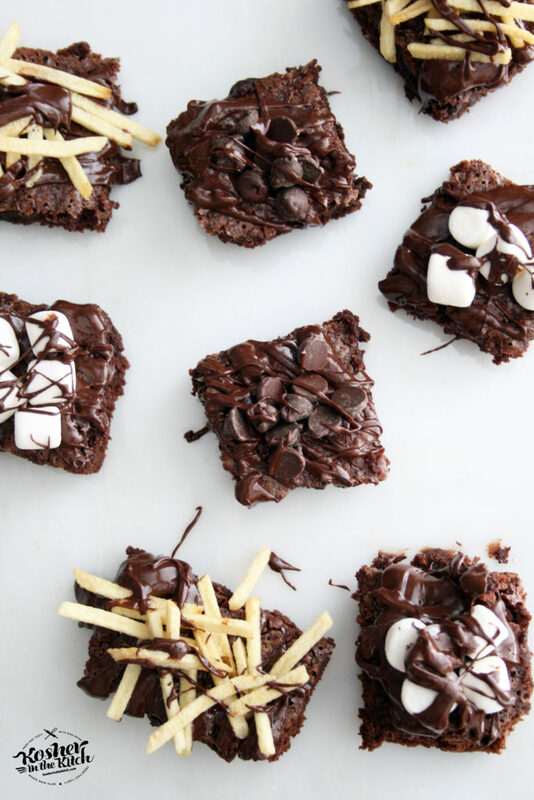 Drizzle over brownies then top with your choice of potato chips, chocolate chips, mini marshmallows, crumbled macaroons, powdered sugar, cocoa powder, or good ol sprinkles. Hi! I have baked these using regular flour swapping same amount as potato starch. Yummm !!! Does cocoa not need a pesach Hecsher? Hi Debbie! Certain items do not require a passover hechsher such as Hersheys regular cocoa powder (not the dark) and items like regular sugar as well as more. Always check with the symbol you regularly use to confirm as these things change year to year. Do you spray or grease the pan ? I use parchment paper. If you don’t use it then grease the pan. These are so easy to make and absolutely delicious! Thank you…my husband and I have each “tested” two pieces. I’ll be making a second batch. A perfect recipe! Nina, this recipe is amazing. Made this for my Passover Seder. These are truly decadent brownies. Their crumb texture is fluffy and moist. I would make this recipe all year round, not just at Passover. I made another batch to get my family through the eight days. This recipe is a keeper. My family thanks you for this wonderful recipe. Also, your food photographs are beautiful. Hi Lisa! I am so glad yolu like them as much as I do =) I adore the chocolate fudge texture and will eat about half a pan straight out of the oven. Not even joking. I love adding chocolate chips to the batter and mini marshmallows on top for a yummy Passover S’mores treat. Happy Passover! I made these for the fist time on passover, now they are my regular gluten free recipe :) super awesome! Swap out the sugar for coconut sugar and it’s healthy too!